The best thing about homemade kids' snacks is that you can tailor the content to meet your little one's tastes. 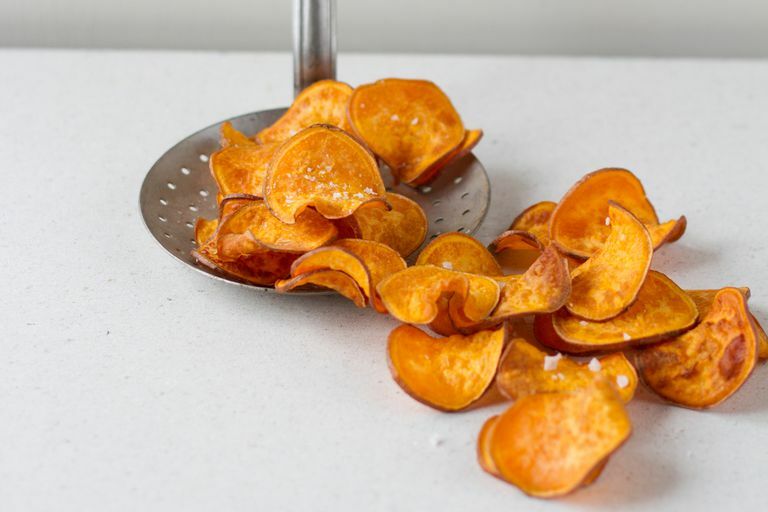 Sweet potato chips that you make at home are a great alternative not only to potato chips ​but even the sweet potato chips you might buy at the store. They are super easy to make and pack a real nutrition punch—they are loaded with vitamins A and C. Serve them at snack time or even as a side dish with lunch or dinner. Prepare the sweet potato. You can leave the skin on if you choose, but in any case, make slices to about 1/8 inch thick. Place in a large bowl with the oil and any seasonings. Toss to coat. You can adjust seasoning to taste. Popular options include garlic, brown sugar, paprika, chili powder. Baked sweet potato chips can be stored up to a week in an airtight container.